What is the Flex & Move class? The Flex & Move class is a 50 minute class which combines yoga, Pilates and therapeutic exercise to improve mobility, flexibility, stability and motor control. 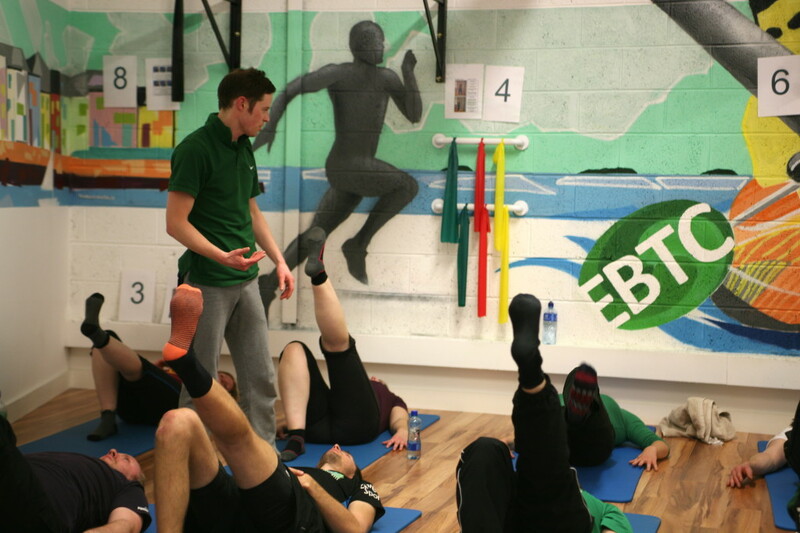 It has been developed and is run by Chartered Physiotherapist Eoin Ó Conaire. There are currently two levels – Level 1 (gentle / beginners) and Level 2 (intermediate). The class is suitable for anyone with difficulties with their flexibility or mobility and/or weakness of the core stabilisers. It is also ideal for those who are recovering from pain or injury. Often our patients complete a block of 8 sessions of the class as a way of rounding off their physiotherapy rehabilitation and preventing recurrence of their problem. It is particularly suitable for office workers who spend a lot of time sitting as it helps to address the typical muscle imbalances related to sitting for long hours. Finally it is also very appropriate for those training or doing sport as a way of dedicating an intensive hour to their musculoskeletal health. Flexibility training is a much neglected component of our general conditioning. In my experience as a physiotherapist, I have observed that it is often people who are highly flexible that tend to gravitate towards exercise approaches that emphasise flexibility – like Yoga – whereas the people who will really benefit hugely from improving range of motion and mobility tend to shy away from this type of exercise. If you search on Youtube for yoga or flexibility exercises, 95% of the videos will be hosted by a highly flexible (usually female) instructor who can demonstrate yoga poses in positions that most of us will never achieve. Now it may not be very marketable for these instructors to show a restricted, inflexible older guy on their videos but this is the group that stands to benefit most from flexibility exercises. The entire population’s relative flexibility or stiffness can be plotted on a normal distribution curve. Most people are clustered around the middle of the curve – they are neither very flexible nor very stiff. Smaller numbers of people are at the extremes of the curve. People with extreme flexibility or hypermobility may be familiar to you from seeing shows like Cirque Du Soleil or pictures of contortionists. On the other end of the spectrum a small number of people are naturally very stiff and restricted. This leaves a moderate number of people who are hypermobile (very flexible) and a similar number of people who are hypomobilie (very stiff). Flexibility is the ability of your muscles and joints to move through their full range of motion so that you can carry out normal everyday functional activities, sports and hobbies. If you are on the stiff, inflexible end of the spectrum, you reach the end of your available range quite soon when say bending or reaching. This can lead to pain, injury or simply difficulty with carrying out the activity. Flexibility naturally reduces as we grow older. What I often see in my practice are patients who are naturally quite inflexible but have never had any real problems because of it – “I could never really touch my toes” – until they reach their forties or fifties. With the natural decline in flexibility, suddenly they are finding it difficult to do certain things, like putting on their socks in the morning, or perhaps getting increasing niggles, pains or injuries when playing sport. In my opinion, if you are naturally on the inflexible end of the spectrum, it is crucial to have a regular flexibility programme that you carry out. This can be attending a Yoga class, a dedicated flexibility class like our Flex & Move class or simply doing some exercises independently at home or at the gym. Muscle strength and trunk stability are vital components of everyday function. When we think about core stabilisers, often we think of images of fit sporty people with rippling six packs doing exercises like sit-ups / crunches. However it is a popular misconception that these so-called six pack muscles are our core-stabilisers. The stabilisers are in fact an important group of muscles that are much deeper. They lie next to the spine, shoulder blades and deep in the pelvis. A fraction of a second before we use our limbs, these deep muscles contract to provide a stable base for us to move from. It has been recognised for some time that weakness in these deep stabiliser muscles can be associated with pain, injury, stiffness and poor sporting performance. The Flex & Move class teaches a variety of exercises that target these stabiliser muscles of the trunk, shoulders and hips. These days, most of us spend much of our day sitting down. Our bodies are not designed to stay in this flexed / bent over position for long hours. Recent research has demonstrated that sitting for more than six hours in the day has a comparable negative affect on your health as smoking! Alpa Patel (PhD), an epidemiologist at the American Cancer Society, tracked the health of 123,000 Americans between 1992 and 2006. Men in the study who spent six hours or more per day of their leisure time sitting had an overall death rate that was 20 percent higher than the men who sat for three hours or less. The death rate for women who sat for more than six hours a day was about 40 percent higher. This is a scary statistic but not one to be taken lightly. In terms of our musculoskeletal system, I see the adverse affects of excessive sitting every day in my practice. Our bodies are a product of what we do, how we hold ourselves and how we move. The postural adaptations of sitting for long hours on a daily basis are well documented – tight hamstrings and hip flexors, increasingly rounded mid back, shoulders pulled forwards and down, restriction of movement in the spine and hips and a much higher incidence of pain. If you sit for long hours in the day, I always recommend that you try to get up from your desk to move around every 20 mins. I also suggest trying to break up the day of sitting by having a walk at lunchtime, going to the gym or attending an exercise class like the Flex & Move class. You could also consider integrating more movement and exercise into your journey to work – can you walk / run / cycle? I also love the idea of “walking meetings”. Rather than sitting around a desk, how about getting out and discussing whilst walking outdoors? Not only are you helping your movement health but I have found that these meetings can be more stimulating and there are less distractions and interruptions. When and where is it held and how much does it cost? Level 1 classes are held every Friday from 1.10pm to 2pm. Coming soon: Level 2 classes. The cost is €120 for a block of x8 1 hour sessions. If you have never attended for physiotherapy at Evidence-Based Therapy Centre, then it is important that you have an assessment with one of our physiotherapists to determine if the class is suitable for you and whether you will benefit from the class. This assessment session lasts 1 hour and is discounted to €50 from our usual price of €100. If you are interested in attending the Flex & Move class, you can call the clinic on 091 727777 or get in touch via the contact page.